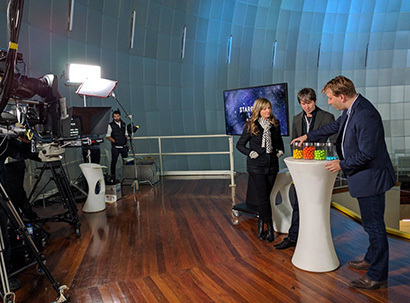 Chris Lintott of Zooniverse shows 'Stargazing Live' hosts Brian Cox and Julia Zemiro the possible planets found so far by the Exoplanet Explorers project, using gumballs to represent different types of planets. 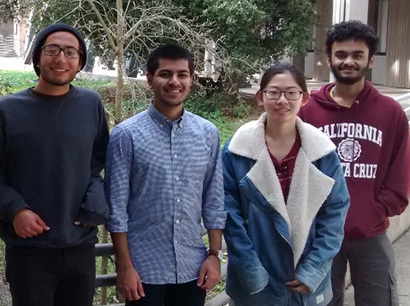 Four UCSC undergraduates worked with astronomer Ian Crossfield to develop the Exoplanet Explorers project: Nicholas Gehlken, Nihaal Zaveri, Yue Yu, and Nithesh Balasubramanian. Thousands of volunteer citizen scientists jumped at the opportunity to help astronomers discover new planets, yielding quick results for a team led by UC Santa Cruz astronomer Ian Crossfield. The Exoplanet Explorers project, launched in early April on Zooniverse, a popular citizen science platform, has already identified nearly 200 candidate planets, including a new four-planet system. Crossfield's team had been working with Zooniverse for months to develop the project when they got a surprise invitation to have it featured on a live television program, 'ABC Stargazing Live', to be broadcast in Australia. The researchers quickly got the project ready to launch, uploading two large sets of data for volunteers to classify. The program, hosted by British astronomer Brian Cox and Australian television personality Julia Zemiro, was presented over three nights starting April 4. More than 10,000 users participated in the project in the first 48 hours, generating more than 2 million classifications. "It would have taken our small team months to wade through all this data, so this is very useful for us. And we got thousands of people interested in the science of exoplanets," said Crossfield, a Sagan Postdoctoral Fellow at UC Santa Cruz. Crossfield's team is using K2, the continuing mission of NASA's Kepler spacecraft, to search for planets around red dwarf stars. By measuring the brightness of stars, Kepler can detect the periodic dips in brightness that occur when an orbiting planet passes in front of a star. Participants in the Exoplanet Explorers project evaluate plots of K2 data to classify stars according to whether or not they show evidence of a planet. According to team member Jessie Christiansen, an astronomer at the NASA Exoplanet Science Institute at Caltech, the four-planet system emerged as a particularly interesting discovery for the Stargazing Live hosts to showcase on the third night of the program. The four planets orbit a sun-like host star and are all "super-Earths" (larger than Earth but smaller than ice giants like Neptune), with orbital periods shorter than 12.5 days, she said. Host Brian Cox called the results "astonishing," and Christiansen and Crossfield are preparing a paper on their findings. The research team is interested in gathering statistics on the abundance of different types of planets orbiting different types of stars. When astronomers began discovering planets outside our own solar system a couple of decades ago, it became apparent that Earth is not a typical planet in a typical planetary system. With enough observations, astronomers can begin to make generalizations about planetary systems throughout our galaxy. "These observations can tell us about the typical end products of the planet formation process," Crossfield said. So far, the candidate planets identified by Exoplanet Explorers include 44 Jupiters, 72 Neptunes, 53 super-Earths, and 15 Earth-sized planets. Crossfield worked with four UC Santa Cruz undergraduates—Nithesh Balasubramanian, Nicholas Gehlken, Yyue Yu, and Nihaal Zaveri—to develop the Exoplanet Explorers program. Other key members of the team, in addition to Christiansen, were Geert Barentsen at NASA Ames Research Center and Chris Lintott and Grant Miller at Zooniverse.